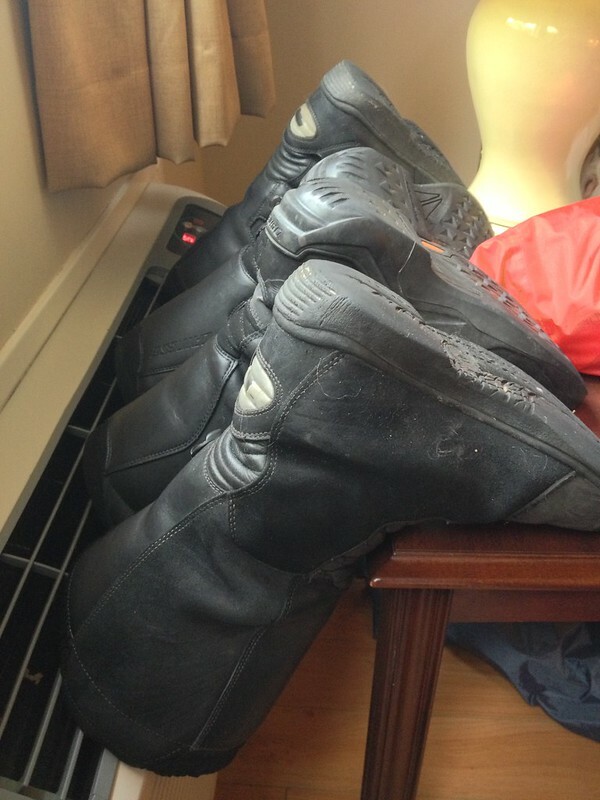 With heavy rain/thunderstorms in the forecast, we had decided to stay in Baddeck today and stay warm and dry in a hotel room. When the day dawned, it was overcast but dry. We debated whether we should chance it and head out, but our boots were still VERY wet, our gear was still wet, and the idea of a day off sounded good. So we decided to stick around and just relax for the day. Had a leisurely breakfast in the Inverary Resort restaurant, and it was SUPER TASTY. One of the best meals I've had on the trip, huzzah! Back at the room, rain still wasn't on offer. I suggested to Kay that we take our laundry into town to wash it and wander around the town a bit, and Kay said that the forecast suggested that the rain was supposed to hit in the afternoon, so we should head out soon. Umbrellas, doggies, and laundry in tow, we walked into downtown Baddeck. The laundromat was owned by the people who owned the Blue Heron Gift Shop, and you could go into the gift shop and buy a cap full of laundry detergent, and get quarters for the machines. So I did. Whilst there, we encountered a gent from Denmark who was here in Canada for 4 months on a rented Harley Davidson. All of his stuff had gotten soaked in the rain, too, including all of his dry clothes in his saddlebags, so he was at the laundromat trying to dry things off. Kay ended up chatting with him and told him all about dry bags – hopefully it'll help him keep his stuff a little better in the future! On the way back to the hotel, we stopped at the Highwheeler Cafe again to grab some sandwiches to bring back for lunch. Still tasty. When we got back, there was still no sign of the rain we'd been promised – just a few sprinkles now and again – and Kay and I were starting to get annoyed. 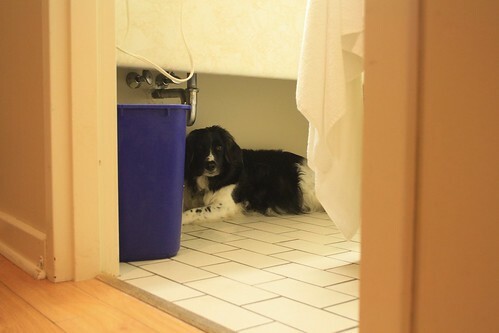 In the meantime, my dog discovered a “cave” under the sink in the bathroom, and would hang out there any time either of us went in the bathroom. Silly dog. At around 4, I looked out the window and a downpour was finally happening outside. Huzzah! We were justified in staying! Kinda. But it only lasted about 20 minutes, and then it was back to not much wet again. Blerg. By the time we decided to head out for dinner around 6ish, there was even a bit of clearing, with the sun peeking through in spots. So much for the weather forecast here in Baddeck, but at least we'd had a restful, relaxing day. 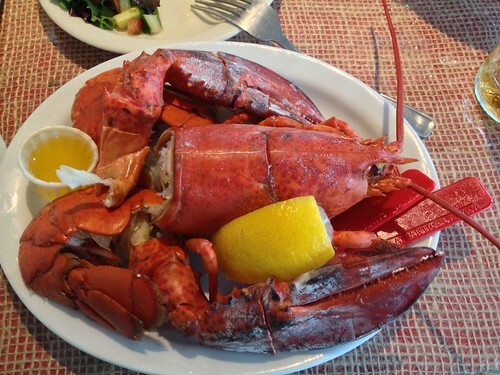 We'd been passing a sign for Baddeck Lobster Suppers, which promised “all you can eat mussels, chowder, bread and more” – and delicious lobster dinners. We haven't yet had a lobster dinner, and it seems to be a Thing You Do in Nova Scotia, so I talked Kay into heading over there. Way too much money later, we were seated and they asked what we'd like to start with. Kay chose mussels, and I chose chowder. The chowder was tasty, if a bit potato-ey (most of the other chowder we've had here has been *very* seafood heavy, but this place seemed to skimp a bit – probably because of the all-you-can-eat aspect). The mussels, though, tasted perfect – like mussels. You could taste the ocean. They were definitely fresh, and after the seafood lunch we had yesterday where they had managed to extract all of the flavor from the seafood, these fresh mussels were a wonderful change. Kay ate most of a bowl, and I helped a bit before getting my own bowl of mussels for my next dish. And then there was my lobster. And Kay's Fresh Local Snow Crab. 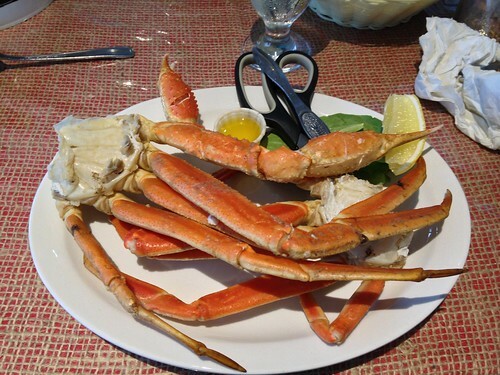 It turned out, Kay liked the lobster better, and I liked the snow crab better, so after we'd each eaten a claw and half the tail, I tried giving Kay my lobster. Unfortunately, Kay didn't seem to know what to do with the main body of the lobster, even though there were instructions on the table – it seemed to be too much work to get more lobster meat out. 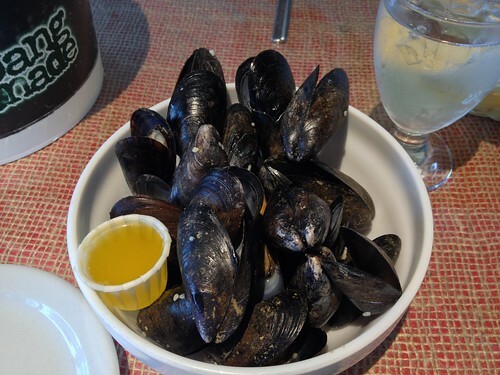 So he went back to another bowl of mussels, but by that point both of us were getting darn full of seafood – which we don't normally eat – and we were getting signals from our tummies that maybe we should stop. So we did. That pretty much wrapped up the day. A little more reading, writing, watching tv and rearranging wet things so they could try to dry rounded out the night for us here in Baddeck.